attendance. 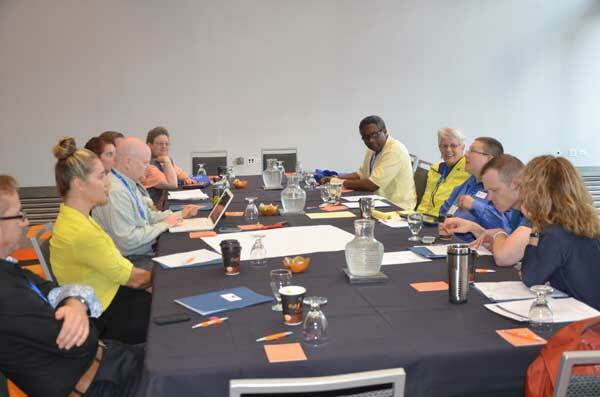 After brief presentations by Mickey Eliason and Bill Cody setting the framework for action and change in nursing on behalf of LGBTQ health, the group formed 5 groups to propose action plans. The groups focused on nursing practice, education, research, policy, and organizational climate. The proposal establishing the GLMA Nursing Section was approved by the GLMA Board of Directors on July 12, 2014. Thank you to Ed Craft, Vice President for External Affairs, and nurse board members Sarah Fogel and Laura Hein for advocating for this action! Maryland. The ballot posted below shows candidates who were on the ballot at the time of the election. You can also download a bio sheet above for each of the candidates on the ballot. Ballots were distributed at the registration desk on the morning of the Nursing Summit on September 10, 2014. The ballots were numbered sequentially to confirm that all distributed ballots are returned at the time of voting, but no record will be made connecting the ballot and the voter. Everyone who was present at the Summit and who completed the “Commitment to Join” form before 11 am on September 10 was eligible to receive a ballot. During the business meeting at 12:45 pm all the candidates on the ballot were introduced by Board member Sarah Fogel. Sarah then called for floor nominations of additional candidates. All on-site nominees affirmed their willingness to serve if elected, and provided a brief oral biographical sketch. Everyone with a ballot wrote in the name of the additional candidate. When the Chair declared that voting is closed, monitors collected the ballots, tallied the votes, and announced the outcome of the election.